In this article, we will learn what is an abstract class, what are rules to define an abstract class, abstract class usage, real-world examples and how to use in real time projects. An abstract class is a class that is declared abstract means it may or may not include abstract methods. Abstract classes cannot be instantiated, but they can be subclassed. Abstract classes cannot be instantiated directly. Abstract classes may be defined with any number, including zero, of abstract and non-abstract methods. Abstract classes may not be marked as private or final. An abstract class that extends another abstract class inherits all of its abstract methods as its own abstract methods. The first concrete class that extends an abstract class must provide an implementation for all of the inherited abstract methods. An abstract method is a method that is declared without an implementation. Abstract methods may only be defined in abstract classes. Abstract methods may not be declared private or final. Abstract methods must not provide a method body/implementation in the abstract class for which is it declared. Implementing an abstract method in a subclass follows the same rules for overriding a method. The subclass usually provides implementations for all of the abstract methods in its parent class. However, if it does not, then the subclass must also be declared abstract. When we create the Java class that implements an interface must implement all of the interface's methods. It is possible, however, to define a class that does not implement all of the interface's methods, provided that the class is declared to be abstract. // The abstract class can also be used to provide some implementation of the interface. //In such case, the end user may not be forced to override all the methods of the interface. Let's see some examples of using Abstract classes in real projects. 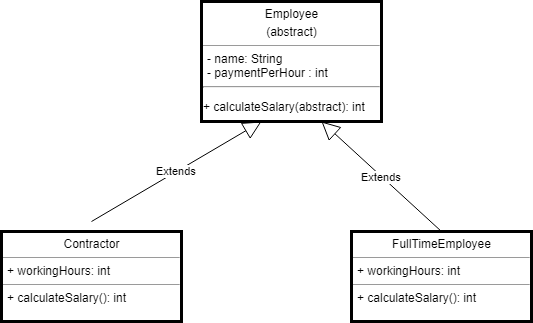 In this example, we create an abstract Employee class and which contains abstractcalculateSalary () method. Let the subclasses extend Employee class and implementcalculateSalary() method. Let's create Contractor and FullTimeEmployee classes as we know that the salary structure for a contractor and full-time employees are different so let these classes to override and implement a calculateSalary() method. Let's write source code by referring above class diagram. Step 1: Let's first create the abstract superclass named an Employee. Let's define a method called calculateSalary() as an abstract method in this abstract Employee class. So the method is abstract and we can leave the implementation of this method to the inheritors of the Employee class. Step 2: The Contractor class inherits all properties from its parent Employee but have to provide its own implementation to calculateSalary() method. In this case, we multiply the value of payment per hour with given working hours. Step 3: The FullTimeEmployee also has its own implementation of calculateSalary() method. In this case, we just multiply by a constant value of 8 hours. Step 4 : Let's create a test class to test the Abstract class. An abstract class is a class that is declared with abstract keyword. A method defined abstract must always be redefined in the subclass, thus making overriding compulsory OR either make subclass itself abstract. Any class that contains one or more abstract methods must also be declared with abstract keyword. There can be no object of an abstract class. That is, an abstract class can not be directly instantiated with the new operator. An abstract class can have parameterized constructors and default constructor is always present in an abstract class.